(WXYZ) — With a new year comes new laws. The ban on single-use straws is gaining popularity and causing controversy in Canada, Europe and in the United States. Off the heels of the first big viral video of the new year -- a McDonald's customer attacking an employee in St. Peterburg, Florida allegedly over a straw -- there could be more brawls like it in 2019 as more plastic straw bans go into effect. In 2019, California restaurants face a $25 fine if caught offering plastic straws to customers. 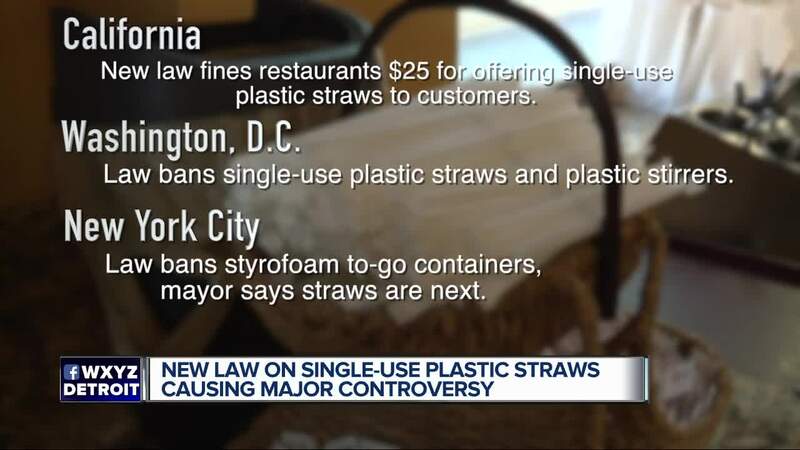 Washington D.C.'s law bans single use plastic straws, as well as drink stirrers. New York City's new law bans Styrofoam to-go containers, but the mayor says straws are the next to go. Some wonder if Michigan could be next? "I think it's nonsense, and I think you should just get a new straw every single time," said Josh Potrykus. "If they were to say no more plastic straws, you have to bring your own, oh I'm fine with that, save the environment save the world." Proponents of the straw ban say it will reduce pollution, while opponents say it wont reduce pollution by much. "Protect our rights for straws and for a safe and clean environment." Other cities and states already have versions of the Straw Law, and many companies are phasing them out voluntarily. Starbucks plans to phase them out by 2020, and Alaska Airlines announced they will be one of the first airlines to phase out straws and stirrers.